Try Continuous Ink System with your Brother DCP-J725DW and make 30 times more quality prints for the same money! Pay only 0.04 USD for A-4 full color print! The continuous ink supply system, or CISS Brother DCP-J725DW, is intended to provide non-stop ink feeding from external ink donor tanks to the MFD (multifunction printing device) or to the printer's head via its flexible multi-channel cable which can be connected either to the special ink system cartridge unit or to the original printer cartridges, depending mostly on the printing device model. The Brother is one more representative of multifunction devices which can shock you with a wide variety of its functions, among which there is photo printing. This printer has fashionable design and it supports all connection types, including cable and wireless net connection. It is provided with a convenient double-size color LC-display and, besides, it can be equipped with a cis brother DCP-J725DW. 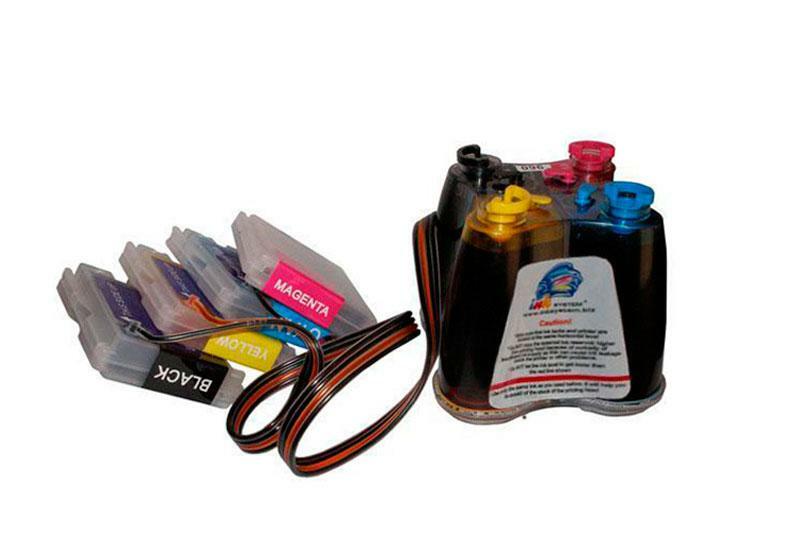 As a standard, the Brother printers use four ink colors and cartridges, which consist of separate ink containing sections. Such cartridge design lets the operator replace only one section, where the ink is over. But still there is a better solution for ink refill, because usually inks are over at the very bad moment. If you equip your printing device with the CISS Brother DCP-J925DW continuous ink supply system, you will considerably decrease your expenses for printing consumables. You may get this possibility not only with this Brother printer model, but with any other model compatible with CISS similar to CISS for Brother MFC-J825DW and CISS for Brother DCP-J925DW. The CISS Brother DCP-J725DW ink system gives you a lot of advantages! With the help of the CISS for DCP-J925DW you can achieve maximum economy, because you will be free from constant purchasing expensive original replaceable cartridges. The total amount of inks within the system tanks substantially (about 5 time average) exceeds that of the original cartridges, while alternative ink may also be much cheaper than the original one. Besides, there is alternative photo paper for inkjet printers, which will let you save a lot of money on consumable printing materials. The CISS for Brother DCP-J725DW can principally ensure high stability of your color printing, just because with it you will never more need to take out the cartridge from you printer for ink refill or chip zeroing. Avoiding these operations, you completely avoid the risk of either air penetration inside the print head or ink leakage. If once a User installs the system and charges it with ink, in future he will only need to add inks to their appropriate donor tanks.